Previous: My favorite pie– bourbon, chocolate, & pecans, oh my! 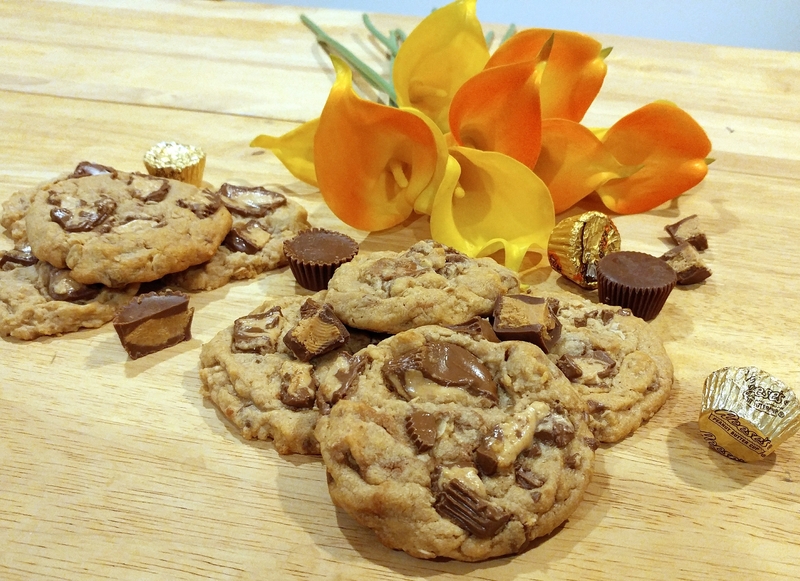 The Peanut Butter Lover Cookie! You’ve heard me say it before– Chocolate and peanut butter is the best combo on earth. Rich chocolate, satisfying peanut butter. So much flavor, you can’t deny it. After giving up chocolate for lent, this is the first cookie I made when it ended! Every bite is full of peanut buttery goodness and studded with blissfully smooth chocolate peanut butter cups. Trader Joe’s milk chocolate peanut butter cups are my favorite kind. Dare I say it…they’re better than Reese’s! Don’t believe me? Try them!! And if you don’t have Trader Joe’s, any peanut butter cups will do. If you appreciate the chocolatey peanut butteriness as much as I do, let’s get baking! 1) Preheat your oven to 375 degrees F.
2) In a medium bowl, whisk together the flour, oats, baking soda, baking powder, and salt. Set aside. 3) In a large bowl (with a stand mixer or hand mixer) beat together the butter, brown sugar, granulated sugar, and peanut butter. Beat on a medium-high speed until the mixture is a pale color and fluffy. 4) Add the eggs and vanilla extract to the butter mixture and mix until fully incorporated. Use a rubber spatula to scrape the sides of the bowl as needed. 5) With the mixer on the lowest speed, add in the flour mixture. Add in all but about a handful of the chopped peanut butter cups. The batter will be thick. Switch to stir with a wooden spoon to finish incorporating everything. 6) Line baking sheets with parchment paper or silicon baking mats. Using two spoons or a cookie scoop, place mounds of cookie dough onto the baking sheets, leaving about an inch between each cookie. 7) Press some of the reserved peanut butter cup pieces into the tops of each cookie dough ball. 8) Bake in the preheated oven for about 8 minutes, or until the edges just start to show a touch of golden brown color. You do not want to overbake these! 9) Cool them for a few minutes on the baking sheet. Then use a spatula to move them to a wire cooling rack (or plate) to cool completely. As always, I’d recommend trying one (or let’s be real– at least 2) warm. 10) Repeat until you’ve baked all the cookie dough. Once they’ve cooled, store them in an airtight container (i.e. tupperware). They’re best the day they’re made but will keep for about a week. They also freeze well, so if you aren’t going to bring them to a gathering or eat them right away, put them in a freezer-proof container and freeze them until you’re ready!